Largest Luxury Bowling Center in Las Vegas! Red Rock Lanes is right up your alley. 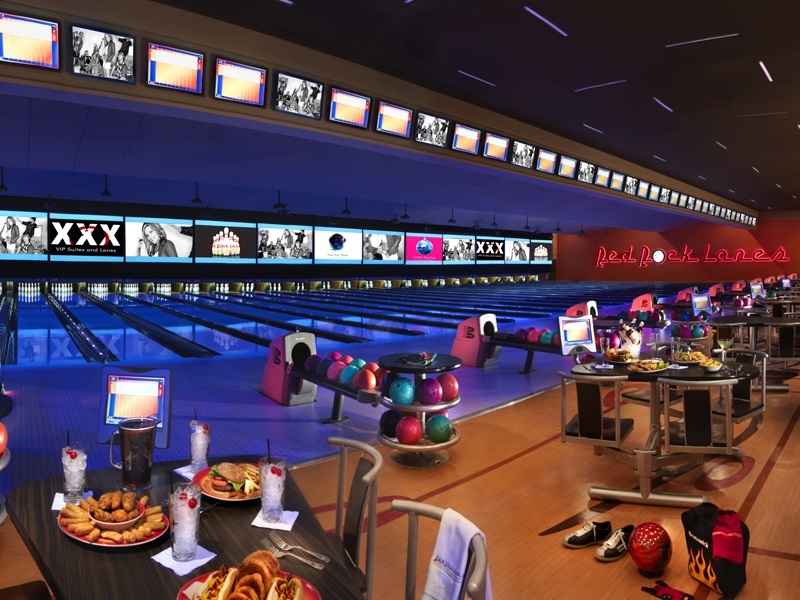 With 72 lanes, lounge, game room and deli snack bar, it’s the largest luxury bowling center in Las Vegas. Amenities include 77,000 sq. ft. entertainment center, 72 Brunswick Pro Anvil lanes featuring Brunswick GSX Pinsetters, Brunswick Vector Plus Scoring System, automatic bumpers/training rails on all 72 lanes, 40" color LCD scoring monitors, 42" plasma televisions between each pair of lanes, 30 16-foot, roll down projection screens, spacious concourse and settee area, lightweight bowling balls, handicap bowling ramps, full-service lounge with lane service, full-service snack bar, cosmic-themed arcade, pool tables, 4 dart boards, shuffleboard table, lockers, friendly staff, full-service pro shop with certified coaches, private meeting rooms, VIP suites in 4-, 8-, and 12-lane configurations, VIP meeting rooms, and fully catered events. We Wrapped It Up For You! Need to add some kick to your weekends? 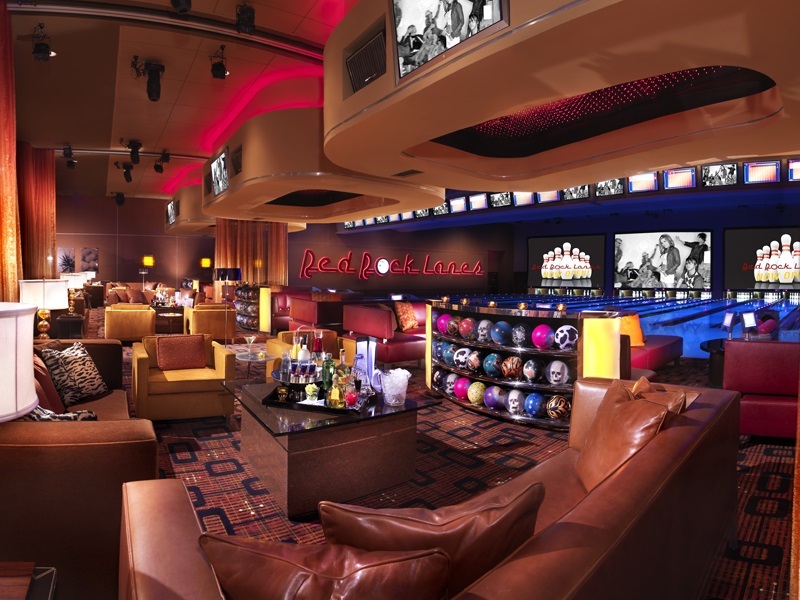 Come try Cosmic Bowling at Red Rock Lanes, Las Vegas’ most luxurious lanes. We turn down the lights and fire up the Cosmic Bowling show. There are dancing lights, hot new music, glow-in-the-dark bowling lanes, pins and bowling balls - it’s light years beyond ordinary. Ready to throw down with your co-workers? Red Rock Lanes has 72 lanes for you and your team to enjoy in a very unique atmosphere that will make any corporate event both memorable and way better than last year’s company picnic. And, don’t worry if bowling isn’t for everyone in the office. 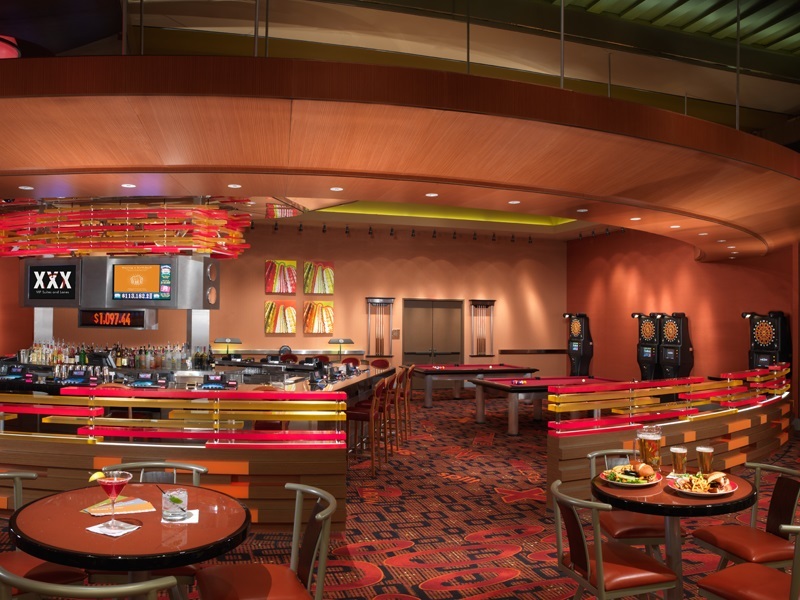 We also have a full-service lounge, shuffle board, darts and pool tables. Let us arrange everything from catering to decorations. Call us for a summer outing to beat the heat, team-building experiences, office incentives, vendor appreciation, holiday parties, fundraisers. A 20% service charge will be added for groups of 20 or more with food and beverage. Whether it’s a fun or relaxing evening with friends or a business event, our luxury bowling suites provide exclusive and unique accommodations that allow you to experience and enjoy bowling in a whole new way. With 12 lanes that may be used simultaneously or divided up into three private suites, you and your party will enjoy complete privacy. Our state-of-the-art sound system allows you to select the mood with any style of music. You can also choose the lighting scheme and videos to ensure the ambience is just right. Top it off with a wide selection of catering options and bottle service and your evening is off to a perfect start — regardless of where it ends. A 20% service charge will be applied to all packages. One week advance reservation is required. Minimum of 8 guests per party package. Non-refundable $50 deposit required. No additional food may be brought into the facility. Packages are for children 15 and under. Guests must arrive 15 minutes prior to party time. Bowling begins promptly at scheduled party time. A 15% service charge will be applied to all birthday packages. The Split: 1 hour of bowling, rental shoes, soft drinks, 4 arcade tokens per guest, gift for the birthday child, balloons, table for gifts & cake, party supplies and invitations, party host / For $12 per person. The Spare: All offered in The Split Package, plus… choice of food (pizza or hot dogs & chips) / For $16 per person.